Running off the top of a mountain with a passenger strapped to her chest is part of Becca Bredehoft’s job as a tandem paragliding pilot. Bredehoft’s dog, Rok, tries to keep up during a solo outing at Curtis Canyon on the eastern side of the valley. “IT TOOK A little while for my mom to think this was a good idea, but now she’s totally on board,” says tandem paragliding pilot Becca Bredehoft about her current career choice. Bredehoft, thirty-one, went for her first tandem flight—as a passenger—in New Zealand when she was twelve. Her father and brother also did tandem flights then, but mom opted out. Back stateside, several months later Bredehoft, her dad, and brother were taking paragliding lessons, making the nine-hour drive most weekends from their home in Billings, Montana, to Salt Lake City, which offered the nearest paragliding school at the time. Bredehoft began flying solo when she was fourteen and completed the requirements necessary for her novice pilot’s rating at sixteen. Becca Bredehoft has been a tandem pilot for five years and flying for twelve years. She took her first paragliding lesson at age twelve. When conditions permit, Bredehoft usually has three scheduled flights with clients each morning—7:45, 8:45, and 9:45—daily from June through August. Flights are scheduled in the morning because that is when the winds are optimal at the top of the Jackson Hole Mountain Resort tram in Teton Village, from where the majority of JH Paragliding flights leave. If the winds are still good after Bredehoft’s 9:45 flight she and the dozen or so other JH Paragliding tandem pilots “go fishing” for clients. “It’s pretty easy to find people that want to go flying,” she says. One day last summer another pilot got eight commercial flights in a single day. “That’s the most anyone has ever done at the Village,” Bredehoft says. 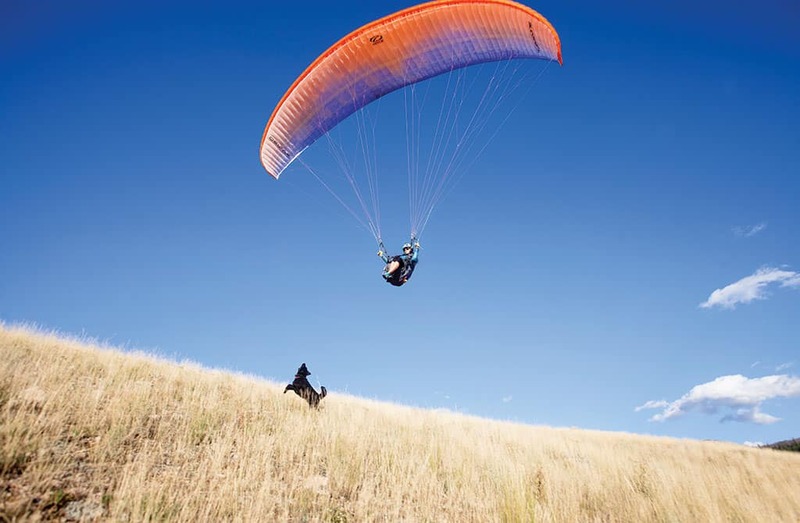 The scheduled JH Paragliding flights are often booked up weeks in advance. The most difficult part of a tandem flight is the launch, which is dependent on wind. If there is no wind, the pilot and client, strapped into the same harness with the client in front, run down Rendezvous Bowl at the top of the tram. The incline of the slope helps, “but we’re still talking about really running,” Bredehoft says. “We’ll start at a walk and I’ll be feathering the wing out behind and then we’ll just start picking up speed until the wind catches us and we’re up in the air.” If there’s a stiff wind—but not too stiff; when there’s too much wind, for safety reasons flights are canceled—launching is easier. You don’t have to run at all, in fact. “The wind will catch the wing and we’ll actually get yanked backwards and up into the air,” Bredehoft says. THE DAY BREDEHOFT takes me for a flight, conditions are somewhere in between, and we briefly walk, then jog, before there’s no longer any ground beneath our feet. Both of us then settle back into the harness—if you’re seated correctly, it’s as comfortable as a sit hammock; if you’re not, the webbing cuts the blood flow to your legs off and it’s amazingly uncomfortable. 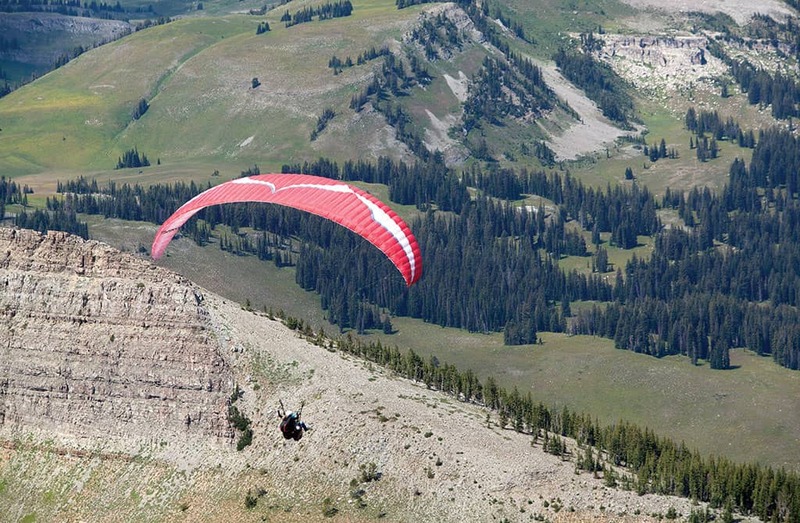 Bredehoft flies with a client above Jackson Hole Mountain Resort.